Yesterday, I talked about momentum and how it can work for you or against you. Consistency is the parent of momentum and both are particularly relevant as I write today’s post – the Financial Slacker Monthly Update July 2016 edition. The site reached a few milestones this month. 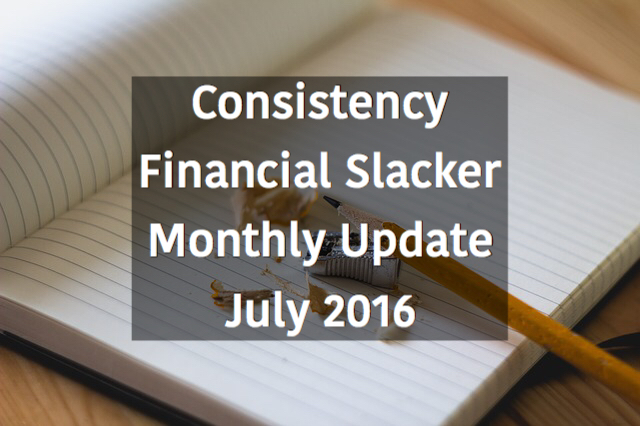 The month of July represents the 8th month since Financial Slacker launched. It’s also the 4th month since I started promoting the site. And during the month, the site passed through the 3 month, or halfway point of the Alexa Challenge. Progress this month was better than expected. Things started off strong. I discovered the benefits of StumleUpon which created a surge of forward momentum. But this was offset by time management challenges. It was a difficult month for me to spend as much time as I would have liked on the site. As sometimes happens, living life gets in the way. And just to be clear, I am fine with that. If I need to choose between spending time with my family at a swim meet and sitting at home writing a post, my family will win every time. But honestly, I shouldn’t have had to choose. While there was more going on this month, I still had plenty of time to write posts, respond to comments, and interact on other sites. Instead, I choose to spend my time doing other things. And as a result of my choices, I spent the last week or so fighting against backward momentum. As I indicated, July was a good month for the site. Traffic continued to increase and reached the highest levels yet. Social media followers also continued to grow and I found new ways to promote and expand the site’s reach. Quality of posts. I was pleased with the quality of posts written during the month. The articles covered topics ranging from making money, to saving money, to investing money. I also shared my thoughts on the uncertain state of the country in light of the recent political and social turmoil. And I started a new series about investing the Financial Slacker way. Page views. In the month of July, page views were up nearly 50% over the prior month. I’m very pleased with this although I am concerned about whether this level can be sustained as a large chunk of those views came from StumbleUpon. I also noticed that while high in quantity (at times), the StumbleUpon views didn’t generate many comments. Comments. Speaking of, comments were down during the month. I attribute this drop to a lack of consistency in posting as well as a lack of activity on other sites. But while the volume of comments was down, the quality was strong. There was some great feedback on questions I posed. The interaction with readers, whether they are fellow bloggers or not, is one of the best aspects of writing for this site. The readers are such high quality and their comments on the topics are insightful. I appreciate every single comment and every reader who takes the time to write something. Social media. The month ended with approximately 1,800 Twitter followers which was up from slightly more than 1,000 at the end of June. I am also pleased with the volume of page views generated through Twitter. Alexa Ranking. And as I mentioned, during the month (July 22 to be exact), Financial Slacker passed through the official halfway point of the Alexa Challenge. When I started the challenge, Financial Slacker’s ranking was 6,827,959 and as of today, the site’s ranking has dropped to 687,942. This is good progress and actually somewhat shocking as I didn’t expect to be at this level half-way through. But with that said, I now realize that as great an accomplishment as it is to reach the current ranking, getting down into the 200,000 range will be an even greater challenge. Consistency. This is the biggest area that I would like to see improved. And it spans almost all aspects of the site. I have found that consistency builds momentum. The more I get in the habit of writing, commenting, and interacting regularly, the easier it is to keep it up. Once you start letting things slip a little, it can be difficult to jump back in. For me, taking willpower out of the process and instead, creating a habit is the best way to operate. Quantity of posts. I posted 10 articles during the month. While the total is fine, it’s the consistency that bothers me. The posting frequency was relatively consistent at every 2nd or every 3rd day up until the last week of the month when the wheels fell off and I went six days in between posts. But I don’t have a regular posting schedule and without that, I fear that I’ll struggle to stay on top of things similar to what happened in the last week of July. I haven’t decided how often I want to post, but whatever the number, I want to set up a consistent approach. Comments on other sites The last few weeks I have been absent from participating on other sites. Again, the lack of a consistent process negatively impacted this activity. This is especially disappointing as it not only impacts Financial Slacker, but it impacts my fellow bloggers as well. I will do everything I can to ramp back up my participation. Guest posts. This is a great way to connect with new readers and support my fellow bloggers at the same time. But I have really struggled in this area. With so many other priorities and often having just enough time to get an article written for Financial Slacker, it’s been a challenge to also write guest posts. But I am committed to supporting other sites and will be reaching out offering to write guest posts for others. Social media interaction. While I am pleased with the increase in Twitter followers, I would like to improve my interaction with those followers. It’s another area that needs more consistency. Also, I plan to dedicate more time to developing other social media channels including Facebook and Pinterest. In the month of July, Financial Slacker made a small profit. And while I didn’t start this site to make money, of course, like everyone I wouldn’t mind making money from the site. But it hasn’t been my focus. I haven’t treated the site as a business. and I’m not expecting much. Although I’m still looking at ways to leverage the site to make a little money, my goal is not to use the site as a source of income (at least not initially), but I would like to operate the site at breakeven. I have a few ads that run, although I had them dialed down for much of the month. I’m really not sure if banner ads are worth it. They are intrusive and the click-through rate is so low. I might be able to increase the CTR if I displayed the banners in more prominent locations and did some other tweaking, but without huge volumes of page views, I still wouldn’t expect to generate much revenue from banner ads. I also have affiliate agreements for a number of products, but my sign up rate for those isn’t all that great either. But even though I haven’t seen tremendous success with affiliates, this is an area that probably warrants additional focus. The combination of sponsored articles coupled with affiliate links has potential. The challenge is finding products that I feel comfortable recommending, that pay a decent rate, and that are somewhat unique for my readers. Readers, the over-arching theme of this update is consistency. This has been my weakness over the past month and I would love to hear back how others have improved their consistency. Yes, stumbleupon traffic is notoriously flaky. You get high page views and visits, but even higher bounce rates. I was so excited the first time I received a SU surge until I dug into the numbers. Typically a few do stick around so it’s worth the effort. With the babies in the house, consistency is my biggest challenge as well. Give scheduling your posts a try. I typically write 2 or 3 posts in a day or two and then schedule them to be published one per week. If you have time to write more in the meantime you can fill in the empty spaces in between existing posts. But it definitely takes the pressure off knowing something good will be published every week, no matter the swim meets, temper tantrums or other vagaries of life. Congrats on your Alexa progress! I do like the idea of scheduling posts. It is much more comforting when you have a little backlog ready to go. And I like spacing them out, allowing you to fill in as you have time. But if you don’t have the time, you’re still hitting your goal. It’s been a fun experience. Can’t wait to see how the next few months unfold. Hey there FS, after reading through your post I have come to the opinion that you’re beating yourself up too much on what you feel didn’t get achieved and should focus on what did get done. This is all said with the greatest respect of course. I’m guessing that you started this blog for much the same reason as most of us and that was to share your knowledge, extol the benefits of prudent financial management, and most of all, have fun. Considering your short time blogging, you have achieved some great numbers in followers and comment’ers. Much better than mine and I’ve been doing this almost as long. Your posts are always of great quality and how you manage to write 2 to 3 a week with consistent and varied content is beyond me. As you say, if it’s a choice between family times or blog writing, family wins every time. And so it should be. Once we start substituting real life for online life, it no longer becomes fun. I hear you. Blogging has been fun and I’m going to make sure it stays that way. I love your focus on consistency, but you need to give yourself a break too 🙂 Your family comes first and you know that – and that’s the most important thing. This community seems to really stand behind one another and I don’t believe it will take time to get reconnected to the same level you were. So give yourself a pat on the back and move forward! We’re in this together! This community is great. I appreciate your support. Congrats on being halfway through the challenge. I’m sure you’ll figure out a way to stick to it consistently in the future. Blogging is a great habit. I am looking for ways to stay on the consistency path. I’ll let you know how it goes.